A Solid Connection is a connecting technique that joins previously cuttable stones to each other so that there is no gap between them. Because all the stones now belong to the same chain, the stones connected this way can never be separated from each other again. This is in contrast with eg. a hanging connection, where it is at least theoretically possible to separate the stones again at a later point. As a go term, Solid Connection refers to a similar idea as the Japanese term katatsugi. Since a shape or a group can also be solid, interpreting the term to mean any connection that makes a solid shape may cause confusion. To avoid confusion, Robert Jasiek prefers to use the term String Connection instead. is a solid connection. The black stones are physically connected, with absolutely no way for White to separate the stones. 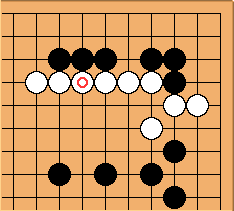 here is a solid connection in the context of the 3-4 point high approach inside contact joseki. 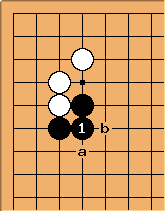 Black could also make a hanging connection at a, which would let him extend further down the left side, at the cost of some negative potential such as the peep at b. Either would be joseki. Solid connection is also known in Japanese as pin-tsugi. 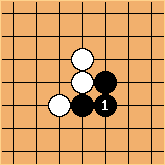 here is a pin-tsugi, move 110 in the fourth game of the 40th Judan Title Match, with Takemiya Masaki playing white against O Rissei. The need for two separate terms is the topic of a heated discussion.